To activate your Lucky Star Wand, remove the pull tab & press the button. Light in the base shines a calm steady light; no flash. Dimensions (WxH): 4 in. x 9 in. 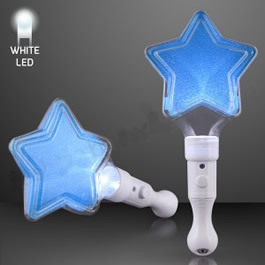 LED Color: White Star Color: Blue LED Blue Lucky Star Wand comes ready to use with 3 replaceable AG13 Batteries.